Last month, we saw the first LEGO Minifigurine go boldy into space, where no brick-kind has gone before. This week, Lego astronauts will finally have a place to stay now that Astronaut Satoshi Furukawa has built a Lego version of the International Space Station inside of the real-life International Space Station. 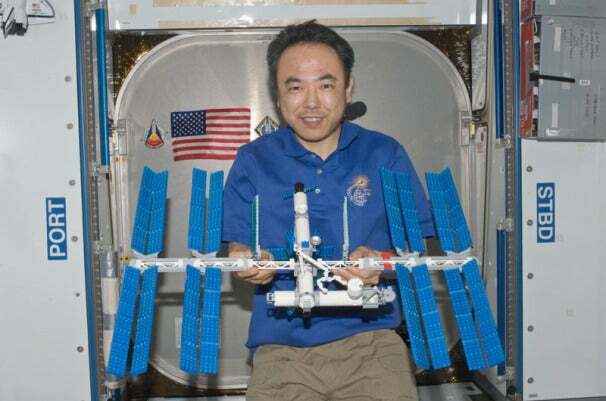 It took Furukawa two hours to build the Lego version of the ISS, and he did it all while he was aboard the orbiting space station. That’s right--mark your “This Day in Geek History” calendars; this is the first time a Lego set has been assembled in space. While it’s pretty simple to assemble Lego here on Earth where we have gravity, it’s an otherworldly experience in the microgravity environment of space. In order to stop the individual Lego bricks from flying into consoles or wedging themselves into things like the thrust control levers, Furukawa built the entire thing inside of a sealed glovebox containment enclosure. The final Lego ISS measures two-feet long and the astronauts say that it could have only been built in space just like its real-life 360-foot counterpart. The model uses so many small and delicate parts that the model probably would not be able to support its own weight under Earth’s gravity. Head on over to CollectSpace for more, including plenty of photos and quotes from Satoshi. At this rate, we’ll have minifig cosmonauts flying up to do their own space missions.